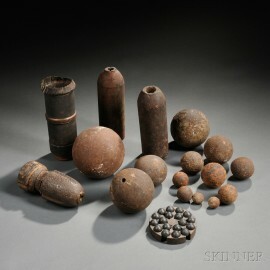 Group of Artillery Projectiles, c. mid to late 19th century, iron round balls, canister shot, an empty canister shot with wooden sabot, a 3-inch absterdam, and others. Provenance: From the collection of the late Peter F. Frazier and M. Prudence Fleck. Some have rust and are in relic condition, the absterdam round is unfired with remnants of its original paint.